I am working at coffee shop;) Looks delicious!!! My part-time job is hard, and I'm always exhausted, but I look forward to free drink and ice cream only for fellow during a break time! Actually, I don't like coffee well, but I want this machine.....espresso machine:D If there is it in my home, I can make delicious espresso, mocha and latte at any time! 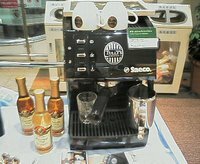 I want it, but I don't afford to buy it because it is so expensive, 32000 yen! It is about 300 dollars! I don't have money to spend for it:P I'm waiting the day that someone presents me it:) lol! (Maybe nobady dosen't give me:D) I'm not so good at making coffee, and I need to practice more, but it is so enjoyable for me:)!!! ooo...im addicted to coffee...lucky u!!! Ohhhhhhhhh woww! The first pic was sooo yummyyyy!!! ummmmm...made me go hungry!! slurp slurp! I need a coffe machine! you should be working in Tokyo...or maybe i should work in hokkaido? we have a tully's in our building. i will tell the staff there that I know you, ha! Wow... The ice cream looks sooo yummy!!!! I really wanna eat it! 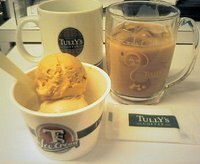 I often go to Tully's Coffee in Sapporo, I'll eat an ice cream next time:D! Really? Are you a Tully's fan? I heard it at the first time!!!! Ice cream is a little expensive, 320 yen;P Can you afford it? Oh, it is too expensive! Is that ice cream yummy? Thanx so much for your kindness, Keshi:D But I have no idea when I will get married...unfortunatelly..
You'll have to tell me where the shop that you work in is so I can visit there when I come to Sapporo! My friend work in TULLY'S COFFEE. It's so wonderful for you able to make coffee. Espresso is great but I prefer Cappuccino. It's amazing to touch the coffee foam by your lips, isn't it? I love your posts, where do you work, i miss your entries :c.